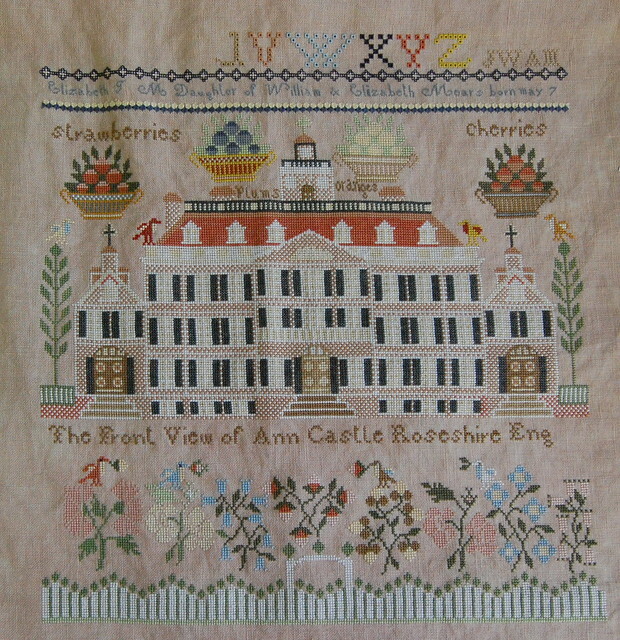 I went up to Amy's for a day of stitching and chatting yesterday. It was so nice to get away! I worked on Christmas Garden while I was there. Earlier in the week I worked on Elizabeth Mears. And last, but not least, I got a little bit of stash while at Amys. I couldn't resist getting another fat 1/4 of the pretty dye-lot of Vintage Lt. Examplar that I'm using for Christmas Garden. Well, next week is going to be very busy. The kids have field trips, egg hunts and dentist appointments. We are also going to be heading down to Florida on Thursday for spring break. We'll be down there for over a week, so I'll post when I can. I hope you all have a wonderful Easter with your families and friends. Enjoy your trip and have a Happy Easter! Beautiful progress on your samplers. What eye candy on this post! Wunderbarer Fortschritt. Ich liebe das Haustuch. 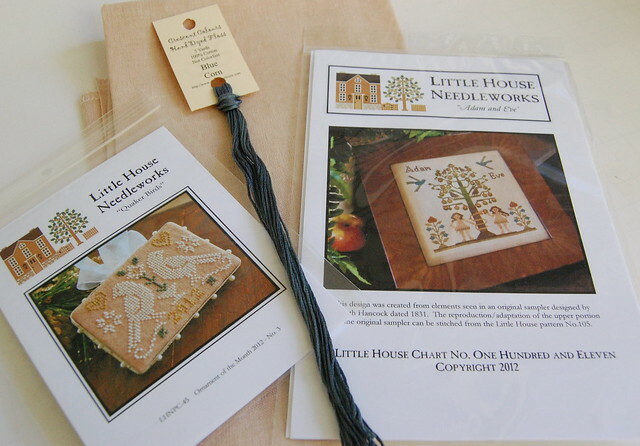 Wonderful stitching and stash! Just love how Christmas Garden is coming along! Happy spring break!! 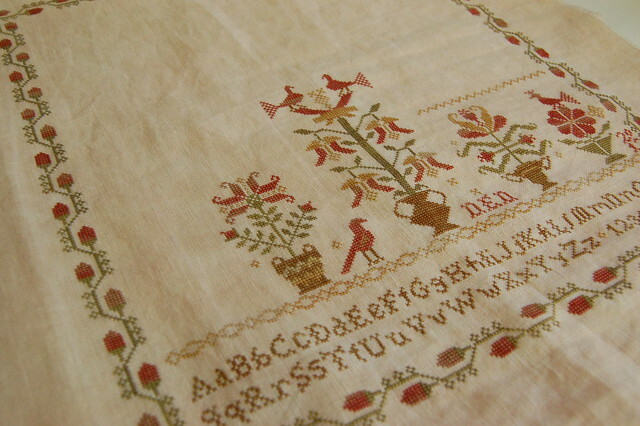 Beautiful stitching - takes my breath away. 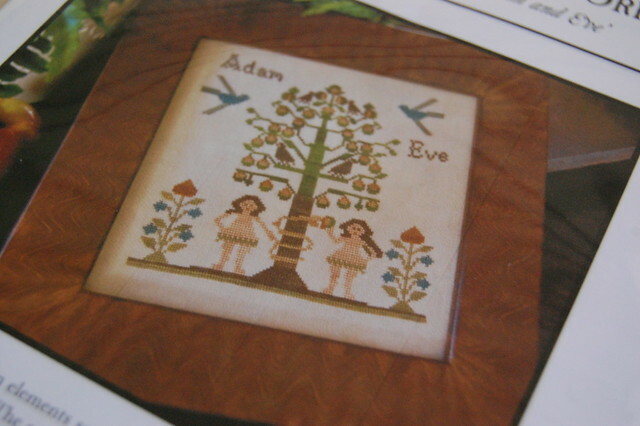 I love that Adam and Eve design. Your Christmas Garden is looking so pretty! Nice stash too. I'm too mad at LHN for splitting up the A&E from the rest of the design and not reproducting the whole thing as is to want to touch that one. lol! Have a great Easter! Lovely progress Nichole!! Enjoy your time away & Happy Easter! Great that you got to spend time with Amy. Your stitching is looking beautiful as always. Your Elizabeth Mears Looks fantastic. Beautiful stitching, as always,Nicole! EM is an amazing project and will be quite the stunner! CG is also a lovely sampler and one that's starting to call my name. Have fun in FLA! When I saw your post, all I could think of was eye candies! Beautiful stitching, Nicole. Those eyelets alphabets looks like fun. Beautiful progress! Lovely photo's as always!! Lovely progress on both pieces - Elizabeth is really spectacular! Beautiful progress! I'm so happy to see your pieces growing. Hum...our stash is so similar... Have a great spring break! What nice progress you've made. Love the new stash too. Be well and be safe on your tip. Happy Easter! Both samplers are gorgeous and I love your new stash. Your Christmas Garden is so pretty, Nicole! You've made good progress on it. I love your Elizabeth Mears! She is so pretty. You don't have too much more to do. Love how your Christmas Garden is coming along. And the more I see of Elizabeth, the more I fall in love with her - she's gorgeous!!!! WOW! Nicole your needlework rocks. They're both looking lovely, great progress. 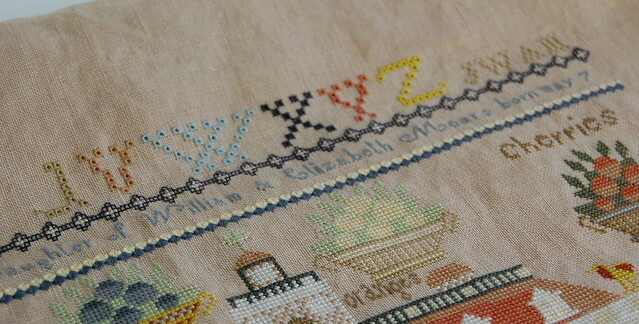 I love both of those samplers, but I especially love that eyelet alphabet! So delicate and pretty!! Great stash enhancement too!! Nicole, I hope you and your family had a nice easter. The eyelet alphabet on Elizabeth Mears is darling. you have some gorgeous WIPs! Love to see your progress. Wonderful projects you have going.